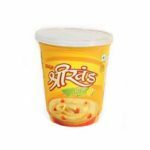 Shrikhand is a semi soft, sweetish – sour, whole milk product prepared from lactic fermented curd and is very popular in India. 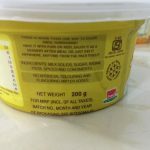 As with many traditional Indian delicacies, Amul Shrikhand is very sugary (on dry basis) at 72.5% by weight, which is harmful for diabetics and those who are obese. The excess sugar present in this delicacy makes it unsafe except in small quantities for the healthy, and unsafe even in small quantities for those suffering from diabetes and lifestyle diseases. 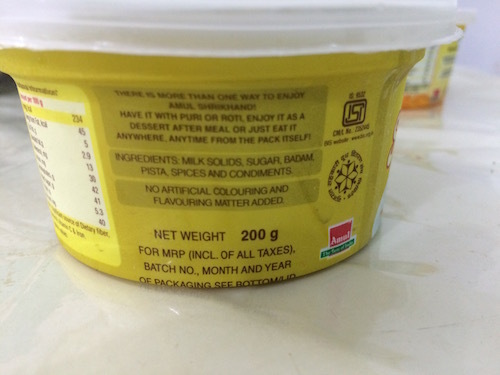 Amul Shrikhand’s ingredient label does not specify which spices and condiments are used, we urge the brand to be specific in mentioning the ingredients clearly on its food label as customers have the right to know what is in their food. 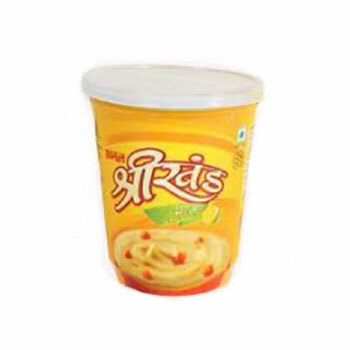 Amul Shrikhand is made from milk solids (chena) which is nutritious and wholesome, but the high sugar content in it makes it unhealthy for many who consume it. This food product has a high amount of sugar which is a matter of concern. This food product does not specify which spices have been used. We believe that it is not responsible behaviour for a brand to avoid clearly stating what ingredients have been used. Certain spices may have side effects or cause allergies. It is important to specify which spices have been used. The condiments used or their ingredients are not specified. A list of condiments should be provided since certain people may be allergic to some commonly used condiments. We believe that it is not responsible behaviour for a brand to not specify exactly what they use. A condiment is a spice, sauce or other food preparation that is added to food to impart a particular flavour, to enhance its flavour, or in some cultures to complement the dish. The term originally described pickled or preserved foods, but has shifted meaning over time. Many condiments are available packaged in single serving packets, like mustard or ketchup, particularly when supplied with take-out or fast-food meals. They are usually applied by the diner, but are sometimes added prior to serving; for example, in a sandwich made with ketchup or mustard. Some condiments are used during cooking to add flavor or texture to the food; barbecue , teriyaki sauce, soy sauce, and marmite are examples.The term condiment comes from the Latin condimentum, meaning “spice, seasoning, sauce” and from the Latin condere, meaning “preserve, pickle, season.